Finally, it’s time for our new book club selection! I’ve loved this novel since the first time I read it, and I am thrilled to share it with you now. Please let me know if it touches you as profoundly as it did me. Heather reads Five Quarters of the Orange by Joanne Harris, a novel about childhood betrayal. 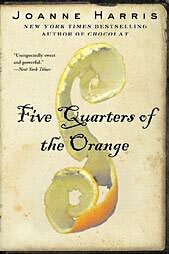 Five Quarters of the Orange by Joanne Harris is a story about the betrayals one can experience in childhood and the effects they have upon one’s life. This is the situation that Framboise finds herself in during the course of this novel. She lives in a small village in France with her brother, sister, and mother. Her father died when she was very young and her mother doesn’t know how to be a parent. Because of this, Framboise has difficulty falling in love, forging friendships, and trusting other people. Eventually, all members of the family go their separate ways, but they are all haunted by what wasn’t supplied to them in their youth. Only Framboise is able to put her past behind her and move on to a better future with her own family and develops a close relationship with her daughters. Therefore, the cycle of the past is then closed forever to the betterment of all involved. In Five Quarters of the Orange by Joanne Harris, a young woman refuses to accept the hand fate dealt her. This novel truly touched me on many levels. Those who have experienced a lack of human compassion will truly appreciate this book. Devoid of emotion, various passages will tug at your heartstrings and may remind you of your own childhood memories. I clearly identified with Framboise and came to truly understand her. She refuses to accept the hand that fate has dealt her, and yet she keeps a part of her locked away. Will you ever be able to see the real Framboise? Or does she not want you to see what she has become? You will find Framboise to be both childlike and astute. You may see yourself in her expressions and reasoning. It is for this reason that you will continue reading this delightful, hopeful, and yet dark tale of the inner workings of Framboise’s life. I know that in reading Five Quarters of the Orange, you too will likely have many questions and opinions about the decisions of this novel’s many colorful characters. Below are the questions I’ve come up with for the book club. Submit your answers and they will be posted in the Book Talk section as they are received. How is the title Five Quarters of the Orange manifested in the structure of the novel? How do you feel about the relationship between Framboise and her mother and between Framboise’s own daughters? Why do you think Framboise returned to the small village in France where she grew up? What motivates Framboise to use an orange to bring on her mother’s migraines? Food plays a vital role within this novel. Discuss the different roles that food plays in each characters life. Joanne Harris lives in England with her husband and daughter. 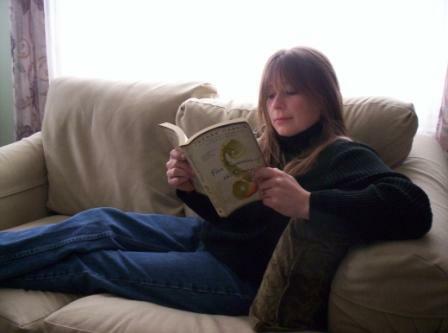 She has written several books including Chocolat, Blackberry Wine, and Coastliners. Her newest novel, Runelight, will be published October 6. Visit her website or click here to buy the book.